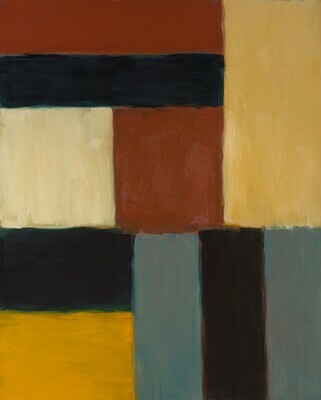 Since the mid-1970s, Sean Scully has painted stripes and variations thereof (blocks, bands, and so forth). He is, of course, not the only artist to do so: other notable examples include Frank Stella, Agnes Martin, and Gene Davis. Yet Scully’s canvases are unmistakably his own, thanks to their distinctive architecture of horizontal and vertical elements, their soft but muscular paint handling, and their earthy colors. Scully begins each painting with a charcoal underdrawing in which he lays out the basic composition. He then paints wet on wet until he feels he has "got it." Sometimes he completes a picture in one round, and other times he must repeat this process over several days. The many layers of paint in ONEONEZERONINE RED, a 2009 work generously donated by Alan and Ellen Meckler, seem to break down the strict geometry of the four-part composition. There is a tension between the architecture of the composition and the looseness of the brushstroke. No visual hierarchy governs the picture space. Every block has its place, balancing or propping another block. Some colors come forward and others recede. ONEONEZERONINE RED has a luscious, glossy surface. This gives it a lightness that stands in stark contrast to Scully’s very physical multipanel paintings of the 1980s, of which the National Gallery’s All There Is, 1986 (Gift of William Zachs), is a prime example. Composed of four attached panels, the earlier painting has a raw surface texture reminiscent of burlap, an effect the artist likely achieved by dragging a large, stiff-bristled brush through tacky paint. ONEONEZERONINE RED is much more refined. The brushstrokes are more fluid, the touch more elegant. The title of ONEONEZERONINE RED comes from the date, 1.1.09, inscribed on the back of the painting above the artist’s signature. It hints at the immediacy of Scully’s process and marks a singular moment in this artist’s gradual, deliberate evolution. Alan and Ellen Meckler, New York; gift 2009 to NGA.